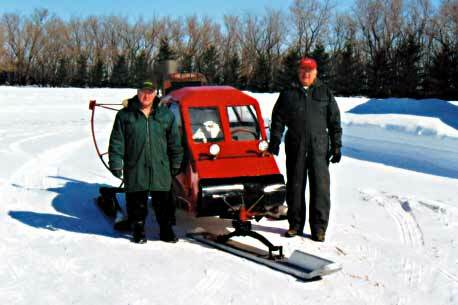 Ever since I was a small boy, I had a desire to have a snowplane. When I was about 8 years old, I remembered our Doctor used to get around in one in the wintertime. One day about three years ago, I was sitting in the coffee shop, I was talking about a snowplane to my wife. A fellow sitting behind us got up to leave, and he asked me, if I wanted to come to his farm up by St. Front, he had the remains of a snowplane in his yard. One Sunday about 2 weeks later we went up there. 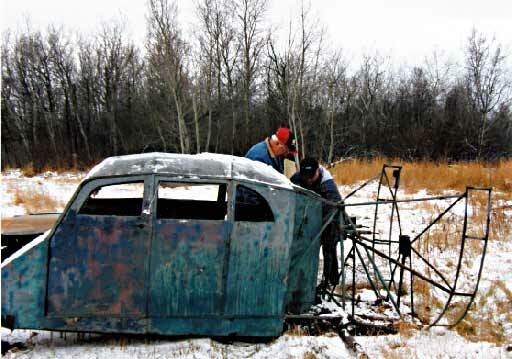 We went to Maurice Pylatuke’s farm and he told me about another snowplane in the bush on land he owned. His son took us up to the old farm yard and that is where I found this snowplane. Maurice was ill at the time, but he told me if I wanted to restore it I could have the old snowplane. It stayed there for 2 years and in the fall of 2007, I phoned Maurice’s son and asked if I could still get the snowplane. He said I sure could. I enlisted the help of a friend, Wally Stratton, and we went up to cut it out of the bush. Maurice has passed away now, but his son Kelly is on the farm. He lifted it out of the bush with his front end loader. Wally and I went the following day with my trailer and brought it home. 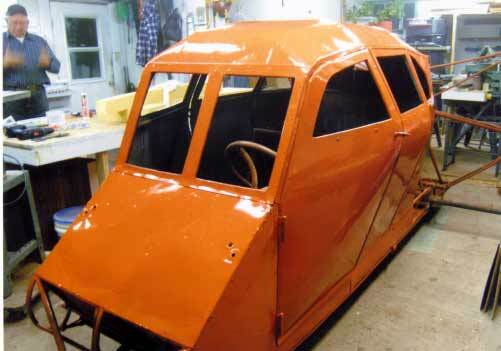 We put it in my shop to start working on it. I’ve done some research on its past, and found that it was built in Korte’s Garage in Muenster. There were six built there. This one had an aircraft motor on it at the time. We spent from November to March working on the project. We built new skiis for it, sanded it down and repainted it. The frame and body were in good shape. We put in new flooring and a new interior lining in it and reupholstered the seats. Our biggest challenge was finding a propellor for it, and after many inquiries we finally ended up making a propellor for it ourselves. We worked on cutting and shaping for about four days plus. 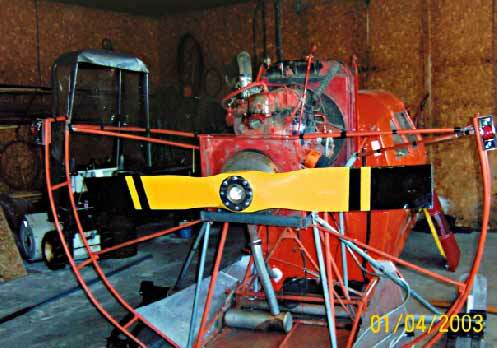 We tried to find a suitable motor for it, couldn’t find a reasonably priced aircraft motor, so we went with a swather motor, inline six cylinder. It could have a bit more horsepower for the propellor we have, but it doesn’t do to bad, about 50+ kph. We ran into a few stu mbling blocks with it, but we enlisted the help of Wes Koenders, between the three of us we got some pretty good results. Wes got us help in the carburator and gas field, so we ended up with about 400 rpm on the propellor. With spring catching up to us we had to park it for the summer. We have some modifications to do this summer but by fall it will be ready to go again. Return to Englefeld's home page.